Malaysia is a magnet for migrants and asylum seekers despite its poor human rights record and failure to ratify key human rights treaties. 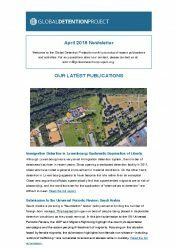 Illegal entry and stay is criminalized and migrants often serve prison sentences before being transferred to one of twelve “immigration depots” while awaiting deportation. Caning, a legacy of British colonial rule, is widespread. In 2013, more than 5,000 foreigners were caned. One of the more vibrant economies of southeast Asia, Malaysia is a magnet for migrants and asylum seekers despite its poor human rights record and failure to ratify key human rights treaties. All unauthorized foreigners, including Rohingyas fleeing Myanmar, are considered “illegal” or “prohibited” immigrants under the Immigration Act. Immigration detention in Malaysia includes various unique and brutal features such as caning and detention aboard vessels. Illegal entry and stay in Malaysia is criminalized and migrants often serve time in prisons before being transferred to one of the twelve administrative “immigration depots” while awaiting deportation. Caning, a legacy of British colonial rule, remains a judicial punishment for criminal offences in the Malaysian Criminal Procedure Code. It was introduced in the Immigration Act in 2002 to deter unlawful migration. According to the Home Minister, 8,481 prisoners were caned in 2013, of whom 5,968 were non-citizens. Denounced as a form of torture by Amnesty International and as “anachronistic and inconsistent with a compassionate society in a developed nation” by the national Bar Association, it is applied to adult males between 18 and 50 years old and leaves permanent physical and mental scars. Some 68,000 people were placed in immigration detention in 2013 according to the local press including mainly Burmese, Indonesians, and Bangladeshis. 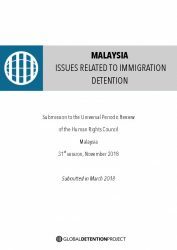 The national human rights institution, SUHAKAM, reported that 1,406 children were detained in detention centres (immigration depots) from January to October 2013. Section 34(1) of the Immigration Act provides that persons may be detained for “such period as may be necessary” pending removal. Immigration detainees generally spend between two months and two years in detention. Procedural standards are reportedly very poor. 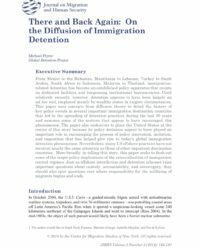 Immigration detainees are rarely informed of the reasons for detention in a language they understand and they have scant access to legal counsel. 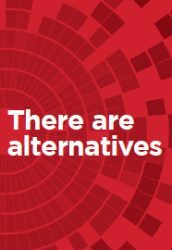 There are no alternatives to immigration detention. Some UNHCR refugee cardholders detained in immigration depots can be released subject to the government’s discretion but the UN refugee agency only has access to them after they are transferred to the depots from prisons where they first serve immigration related sentences. The Malaysian Passport Act empowers immigration and police officers to “lawfully detain” persons unlawfully entering Malaysia on board vessels during the period that the vessel is within Malaysia or the territorial waters thereof. However, no information about the frequency of the application of this measure appears to be available. Act 155, Immigration Act 1959/63. Amended up to 1 January 2006. Section 55E (7). http://www.agc.gov.my/Akta/Vol.%204/Act%20155.pdf. Act 155, Immigration Act 1959/63. Amended up to 1 January 2006. Sections 6(3), 15(4) and 36. http://www.agc.gov.my/Akta/Vol.%204/Act%20155.pdf. Yuen Meikeng. Zahid: Over 8,000 prisoners caned last year. The Star online. 12 November 2014. http://www.thestar.com.my/News/Nation/2014/11/12/Zahid-Parliament-prisoners-caned/. Amnesty International, A Blow to Humanity: Torture by Judicial Caning in Malaysia, December 2010. https://www.amnesty.org/en/documents/ASA28/013/2010/en/. Anil Netto. MALAYSIA: Illegal Migrant Workers May Escape the Cane. Inter Press Service. 20 March 2007. http://www.ipsnews.net/2007/03/malaysia-illegal-migrant-workers-may-escape-the-cane/. Gho Chee Yuan. Government spends RM2m a day to feed illegal immigrants, says deputy minister. The Star Online. 6 January 2014. http://www.themalaymailonline.com/malaysia/article/government-spends-rm2m-a-day-to-feed-illegal-immigrants. Human Rights Commission of Malaysia. Roundtable on Alternatives to Immigration Detention Held on 12th November 2013. http://www.suhakam.org.my/wp-content/uploads/2013/12/Report-on-Roundtable-on-ATD-Malaysia.pdf. 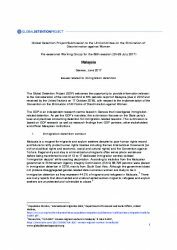 Report of the Working Group on Arbitrary Detention: Addendum: Mission to Malaysia. A/HRC/16/47/Add.2. 8 February 2011. Act 150, Passport Act 1966. Incorporating all amendments up to 1 January 2006. Section 5(3). http://www.agc.gov.my/Akta/Vol.%204/Act%20150.pdf. Gho Chee Yuan. Government spends RM2m a day to feed illegal immigrants, says deputy minister. The Star Online. 6 January 2014. Human Rights Commission of Malaysia (SUHAKAM). Annual Report 2014. 15 April 2015. Human Rights Commission of Malaysia. Roundtable on Alternatives to Immigration Detention Held on 12th November 2013. Undisclosed sources. Global Detention Project Questionnaire. December 2014. Lenggeng detainees in a state of tension. Tuesday, April 29, 2008. English translation of "Tahanan di Lenggeng tertekan." 24 Apr 2008. Malaysiakini. Parliament of Indonesia. Hansard House of Representatives Third Meeting, Vol 54, (unreported), 25 November 2014. Preliminary observations and recommendations by the UN Special Rapporteur on the right of everyone to the enjoyment of the highest attainable standard of physical and mental health Mr. Dainius Pūras Country Visit to Malaysia, 19 November to 2 December 2014. Kuala Lumpur, 2 December 2014. Federal Constitution of Malaysia as at 1 November 2010. Act 155, Immigration Act 1959/63. Amended up to 1 January 2006. Act 670. Anti-Trafficking in Persons and anti-Smuggling of Migrants Act 2007. As at 1 November 2014. Section 25. Act 537, Prison Act 1995. Incorporating all amendments up to 1 October 2009. Act 150, Passport Act 1966. Incorporating all amendments up to 1 January 2006. Malaysia. Immigration Regulations 1963- Regulation 39(b). Act 155, Immigration Act 1959/63. Amended up to 1 January 2006. Section 6(1). Act 155, Immigration Act 1959/63. Amended up to 1 January 2006. Section 32. Act 155, Immigration Act 1959/63. Amended up to 1 January 2006. Section 34(1). Act 155, Immigration Act 1959/63. Amended up to 1 January 2006. Section 15(4). Act 155, Immigration Act 1959/63. Amended up to 1 January 2006. Section 8. Act 155, Immigration Act 1959/63. Amended up to 1 January 2006. Section 36. Act 155, Immigration Act 1959/63. Amended up to 1 January 2006. Section 6(3). Act 155, Immigration Act 1959/63. Amended up to 1 January 2006. Section 51(5)(b). Federal Constitution of Malaysia as at 1 November 2010. Article 5(4). Act 155, Immigration Act 1959/63. Amended up to 1 January 2006. Section 35. Act 155, Immigration Act 1959/63. Amended up to 1 January 2006. Section 33(2). Act 155, Immigration Act 1959/63. Amended up to 1 January 2006. Section 59(A). Nah, A.M. 2014. The illusion of rights: Barriers to justice for non-citizens in Malaysia. In Lemiere, S. ed. Misplaced democracy: Malaysian politics and people. Kuala Lumpur: SIRD. Act 155, Immigration Act 1959/63. Amended up to 1 January 2006. Section 55(1). Malaysia. Regulation 11 of the Immigration (Administration and Management of Immigration Depots) Regulations 2003. Act 155, Immigration Act 1959/63. Amended up to 1 January 2006. Section 51(A). The ICRC regional delegation in Kuala Lumpur.15 May 2014 Overview. 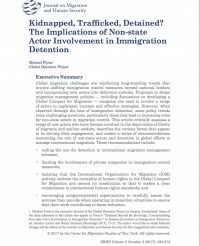 This article critically assesses a range of new non-state actors who have become involved in the deprivation of liberty of migrants and asylum seekers, describes the various forces that appear to be driving their engagement, and makes a series of recommendations concerning the role of non-state actors and detention in global efforts to manage international migration.